Lauren’s First and Goal Foundation announced that it has raised more than $114,000 as a result of its 12th anniversary football camp on Sunday, June 7 at Lafayette College. Camper registrations and donations from the one-day high school camp support the foundation’s mission of funding pediatric brain tumor research and patient services and assisting families living with the disease. University of Michigan head coach Jim Harbaugh and his coaching staff attended the camp, with Harbaugh serving as this year’s featured guest speaker. He spoke to the more than 2,000 student-athletes during lunch. Loose also paid tribute to Army Head Coach Jeff Monken and Rutgers University Head Coach Kyle Flood, two previous guest speakers and honorary foundation board members who returned to volunteer at the event this year. Harbaugh now joins Monken, Flood, and his brother John, along with nine others as an honorary foundation board member. More than 2,100 high school athletes from 18 different states and Canada traveled to the College’s Metzgar Athletics Complex to receive instruction in a variety of offensive and defensive skills from more than 360 college coaches from more than 100 schools around the country. 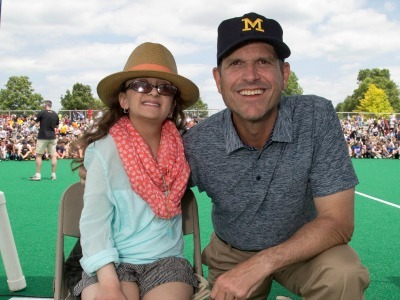 In addition to the Pennsylvania event, LFG will host its sixth annual Lauren’s First and Goal Football Camp Ohio on Sunday, June 14 at Otterbein University in Westerville, Ohio. Ohio State head coach Urban Meyer returns as the featured guest speaker. Student-athletes can register on our football camp page. The foundation has awarded $1.46 million to pediatric research, patient services and families since 2004. Follow the latest foundation news on Twitter and Facebook.